I love foraging and I love making cordials but since having children little of either has happened. My last attempt to make elderflower cordial was with a 1.5 year old Euan and it took all of his nap time just to prepare everything. 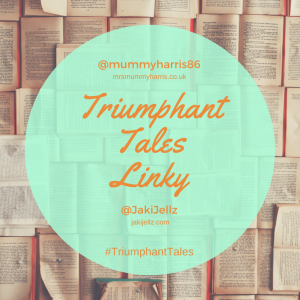 My resounding memory was how time consuming it was between the car journey to forage, de-bugging the flower heads, chopping lemons and sterilising bottles. I had over-picked last time which meant doubling up quantities and I reached a new realisation that making in bulk is not always the best option! When my friend Sonia said she’d like to make cordial for the first time and offered the use of her kitchen if I wanted to join her I was so excited. Luca and I foraged the elderflower from our local park next to Euan’s school and we picked just the specified quantity for the recipe Sonia was going to follow. It felt like no effort at all, just a lovely outdoor pastime and we were even able to use foraging as one of our #30dayswild nature activities. 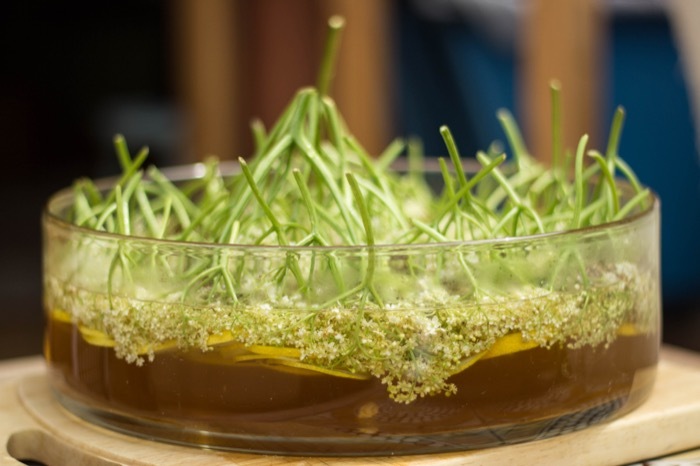 It was so simple to turn our foraging and preserving into a play date and social activity. 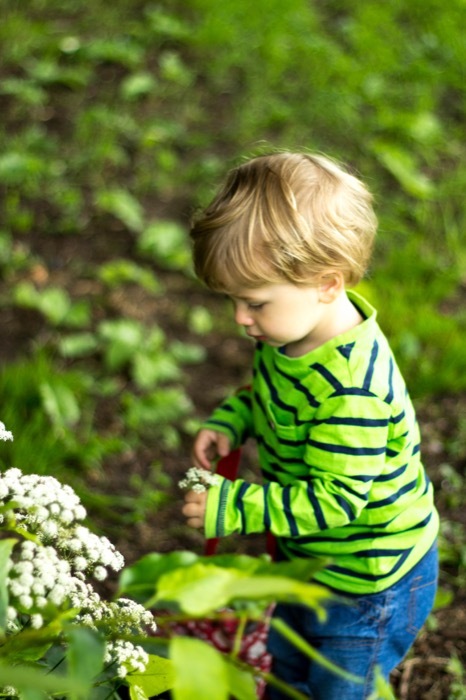 It was a gorgeous sunny morning when Luca and I went out foraging and we played in the park for 45 minutes before picking so our flowers would be as fresh as possible when we arrived at Sonia’s. Luca was such a willing helper and the flowers were beautifully pungent. Folklore suggests picking on a dry, sunny day results in more flavourful flowers and this certainly seemed to be true for our resulting cordial. We also didn’t see a single bug on our flower heads so the timing was just right. 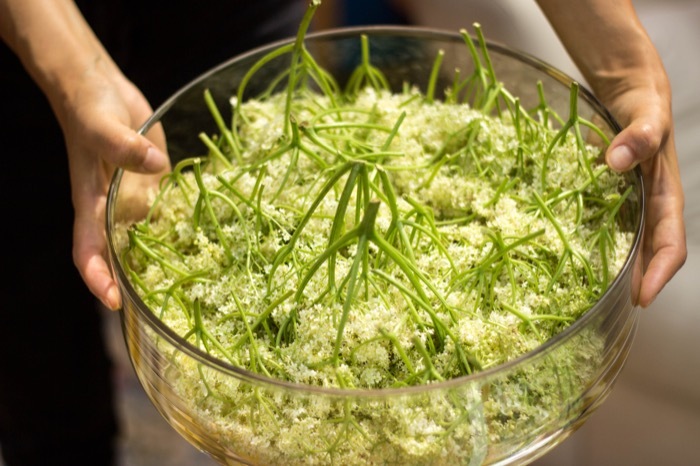 The preparation of the elderflower heads for infusing this time round was as simple as giving them a little shake to check for bugs before sitting them upside down on top of slices of lemons. Sonia had a beautiful glass dish and her careful layering of lemons and positioning of flower heads was like watching an artist at work. I was inspired by her diligent approach and resolved to take more care next time I prepare food as I’m rather slap dash, focusing more on the speed and convenience of getting it done than giving due care and attention to the task in hand. When I’ve made cordial before I’ve followed the method from the River Cottage preserves handbook where you soak the flowers in water with lemon zest overnight and then add the sugar and lemons the next day. This suited me when I made it as I wasn’t keen on having a sticky mixture infusing on a hot day and with 3 cats in the house. 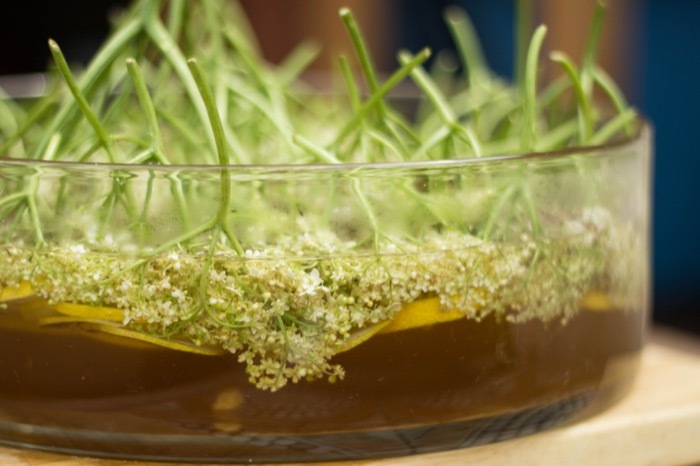 Sonia’s recipe involved using her Thermomix to make a hot syrup and then pouring this over the lemon slices and flower heads. She left it on the counter top overnight and Luca and I returned the next day for bottling and tasting. The flavour was much more intense and finely balanced from all of the ingredients soaking together. Some recipes recommend leaving the infusion for up to 3 days but I think there’s a danger of the lemons going bitter when left that long. Our elderflower cordial was so delicious to drink. It’s going down well with the boys today who are both home with coughs and colds. Both the elderflower and the lemons with their vitamin C content will be giving their immune systems a boost. Sonia plans to use her cordial in cooking too starting with a favourite cake recipe which includes home made gooseberry curd (she’s quite the foody and a real inspiration for re-kindling my love of preserving and trying out different recipes). Make a syrup with 1 litre of water and the sugar. 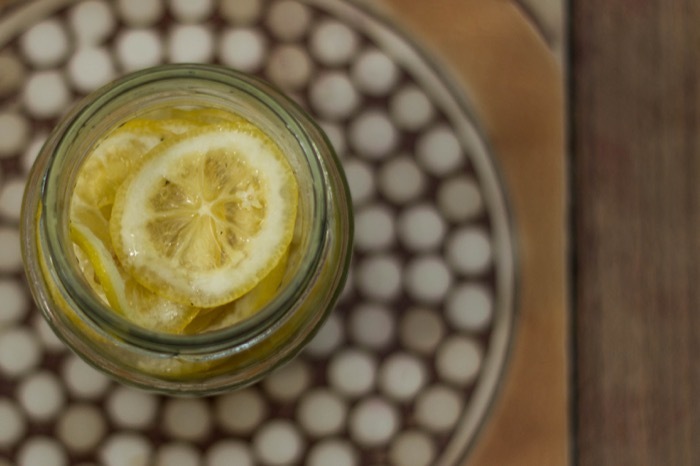 Slice the lemons and layer in the bottom of a glass or stainless steel container. Place the elderflower heads stalks upwards on top of the lemons. Sprinkle the citric acid over the top and pour in half the syrup. Add the remaining 0.5 litre of water to the syrup and mix. 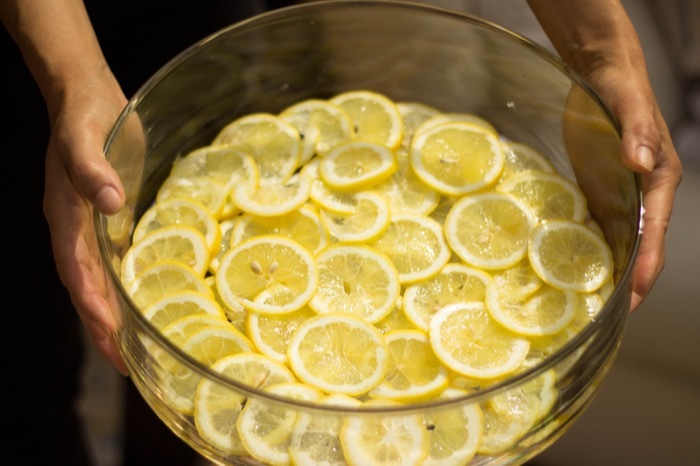 Pour over the flower heads and lemons, cover and leave at room temperature for at least 10 hours or overnight. 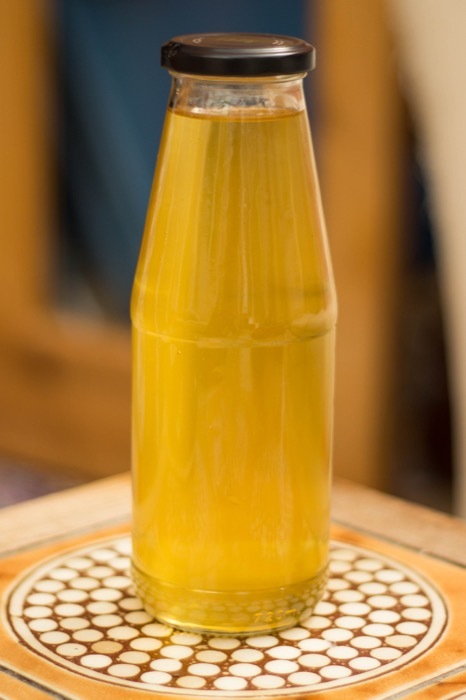 Strain the cordial through a fine sieve (we used a muslin) and pour into sterilised bottles or jars. Once cool store in the fridge. 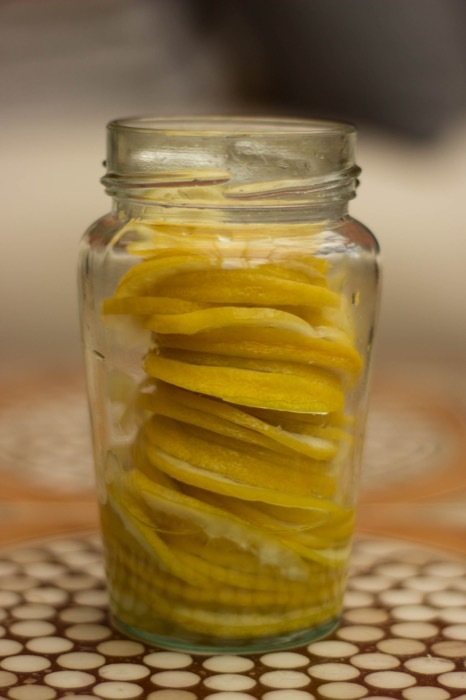 A happy outcome of making the cordial this way was that we ended up with beautiful preserved lemons. I always feel a bit wasteful when making cordials or jellies involves throwing away pulp I wish I could dream up a use for. My initial idea was to keep the lemons to simply add to a glass of water but I love them so much I’ve just been eating them straight from the jar. 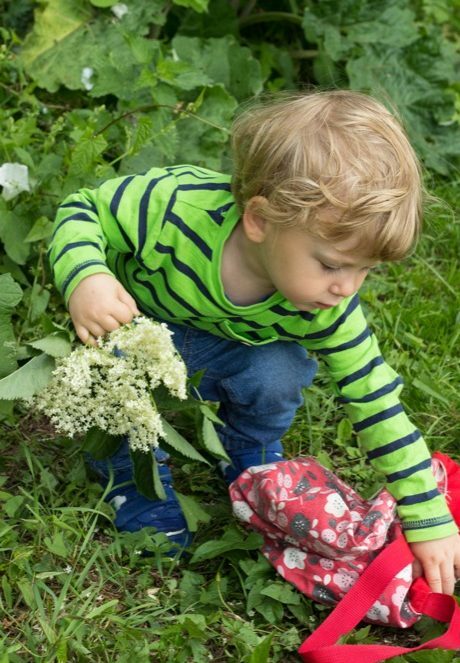 I’m never going to make elderflower cordial any other way from now on and Sonia and I have decided to instigate seasonal foraging play dates ever after. 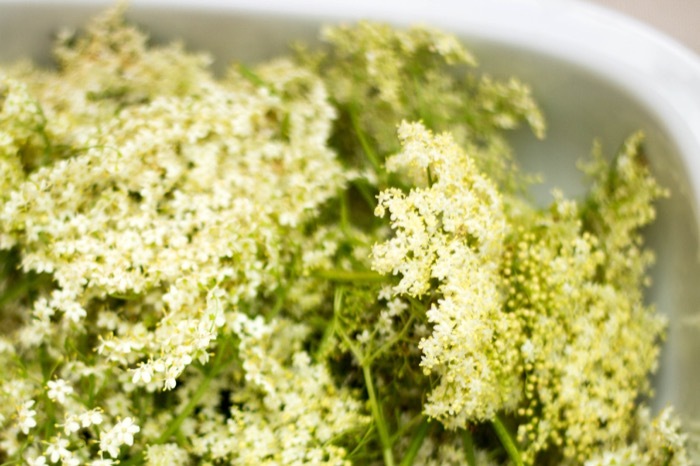 Perhaps we might even try some of these other elderflower recipes. I love this idea! Surely it can’t really be this easy? Definitely one to try with my girls, and I love the idea of baking with the cordial.